As you probably saw in my review, published yesterday, I’m a big fan of Dissidia Final Fantasy NT. It has proven to be one of the few times that I’ve enjoyed a game with a competitive online focus, and I expect that I’ll be playing it for many months (if not years, community depending) into the future. 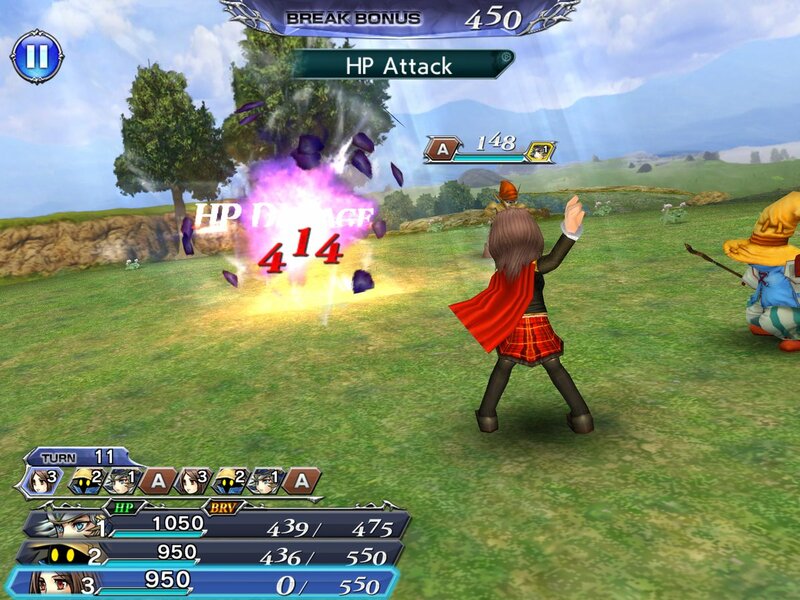 What I didn’t expect – or even know was coming – was a Dissidia Final Fantasy mobile game. Based on the pacey action of the console release I wasn’t expecting much of this at all, but then I started to play and discovered that it wasn’t a fighting game at all. Oh no. 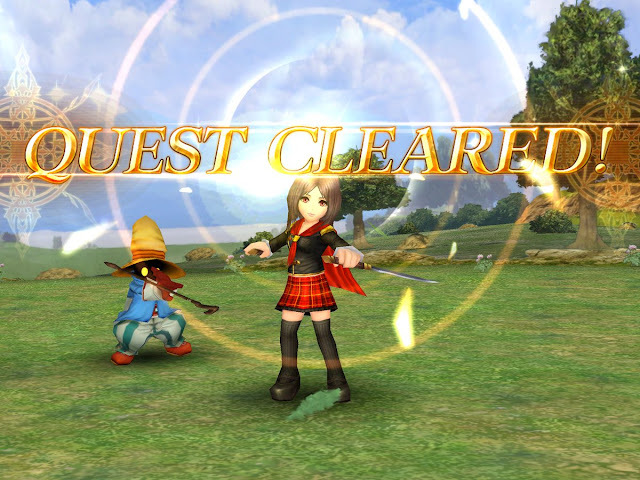 The Dissidia Final Fantasy mobile game (full name: Dissidia Final Fantasy Opera Omnia) is actually a simple, clean turn based JRPG, and I’m quite in love with it. In no small part the reason I’m in love with it is that, unlike the console fighting game, Dissidia Final Fantasy mobile has an awesome cast from the outset. Your initial team of heroes includes Szah (sadly sans chocobo chick in the hair, but still awesome), and, even better, Rem from Final Fantasy Type-0! You people have no idea how much I love Rem. She’s my girl. That cast regularly grows – within the first hour or so of play I had also added Tifa, Cloud, Y’shtola and Hope to my party. 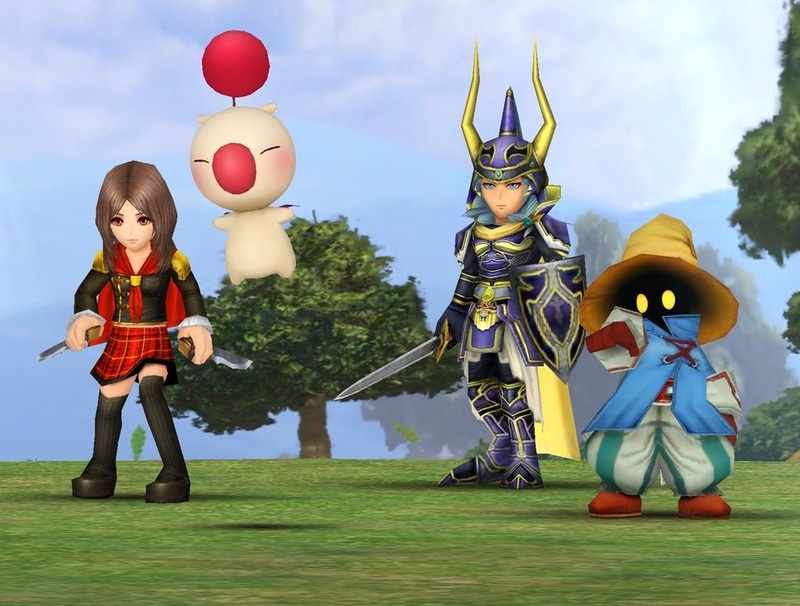 Okay, so it’s not all good thanks to hope, but for the most part this is more the kind of “fanservice” that I am looking for in Dissidia – my favourite characters all teaming up to go beat up on things together. 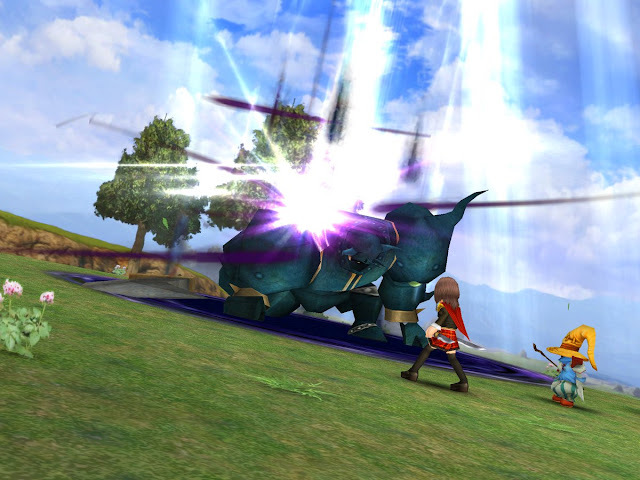 Unlike Dissidia on console, in this one you’re beating up on standard Final Fantasy enemies – goblins, bats, skeletons, flans and iron giants all pop up in the first hour, and progress borrows heavily from the RPG-like story mode of Dissidia 012 – you’ll move from place to place completing quests, which will unlock gates, allowing you to move on to the next area. And all of this is presented through the most gorgeous, cheerful art. Characters are chibi and cute, but not to the point of ridiculousness, as in something like World of Final Fantasy. They still retain their rough shapes and character designs from their main games, but just brighter. There’s even a story to play through, though as is standard for a mobile game, it’s minimalist and more there to break up an endless grind of combat than actually tell a riveting story. Still, it's enjoyable having a moogle "kupo" his way through cut scenes, have Rem chatting about whatever Rem wants to chat about, and bump into other old favourite characters at a frequent rate. The combat system, as I said above, does a brilliant job of taking the principles of the fighting game, and then spinning them into a turn-based combat system. Characters have the ability to do brave attacks (which build up their brave score), or HP damaging attacks (which convert the brave score into damage on the enemy), just like in the fighting game. So the goal is to build up those brave scores until you’re ready to go for the killing blow, while trying to preserve your own team’s health. Characters also have special abilities which can help overcome challenges. Some enemies might be hard to hit thanks to a high “evade” rating, which is where Szah’s aim ability comes in – his “aim” attack will always hit. Tifa, meanwhile, has abilities that help her pound skeletons into oblivion. Thankfully my precious Rem’s ability is universally useful in all circumstances – she has the healing ability. There’s no requirement to take a specific character to counter an enemy – you can still beat flans without a mage in the party even though they’re resistant to all other attacks, for example. It’s harder to get through the battles, but it’s manageable. Compared with full console Final Fantasy games, or even Dissidia Final Fantasy NT itself, this game's combat system is simple. Of course it is, it's a casual-orientated free-to-play game. But that doesn't mean it's unenjoyable. As a time waster while watching TV or on the commute, the battles fly by quickly enough, and, again, the presentation is of such a high standard that it looks like a premium Final Fantasy game. There's just enough strategy in building your combat teams and managing their skills (they're limited to how many they can take into battle at a time) that the game remains mentally engaging, and deciding on the right balance between brave attacks and HP damaging attacks still takes a basic level of skill. It's enough, in other words, to be an enjoyably breezy JRPG experience. I was surprised to find that the gatcha system in this game isn’t to acquire new heroes. I was almost certain going in that it would be like Fire Emblem Heroes or most other mobile JRPGs in that way. Instead, loot boxes are for equipment for the heroes, with the heroes themselves being unlocked by moving through the story mode. It’s important to get good equipment and level it up by combining it with power-up materials or weaker and unused equipment, of course. Enemies scale in difficulty faster than the characters develop in themselves. And getting the really good equipment can take a number of “draws” from the gatcha system. You earn some of the “gems” that you need to do this through play, and then, of course, can spend money to get more gems. Because this is a free-to-play mobile game and by now we all know how that works. Whether I actually spend money on this game or not, I’m not sure at this stage. I’ve played for a couple of hours and love the production quality of it, but whether I love it enough to want to invest in it is still up in the air. It’s a great accompaniment to the console Dissidia, though, giving me more of my favourite characters and a narrative set in the Dissidia universe to cover over some of the weaknesses in that multiplayer-orientated game. Playing the two side-by-side has made this week a real rush of Final Fantasy fanservice joy, I can tell you that much.